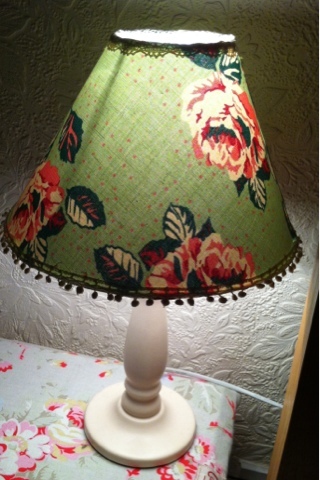 This time I have made a 'Coolie' shape lampshade. This was slightly more tricky than i had anticipated as it was difficult getting the shape right, the drum lampshade was so much easier as it was all straight lines!This time I also used some cotton lace and tassels to decorate......not sure if it is a bit too old fashioned but i like it! I'm looking forward to making lots more lampshades in the coming weeks as a massive roll of sticky backed pvc & tape arrived today from NeedCraft! If you are interested in lampshade making i can really recommend them for all lampshade supplies and really speedy delivery.